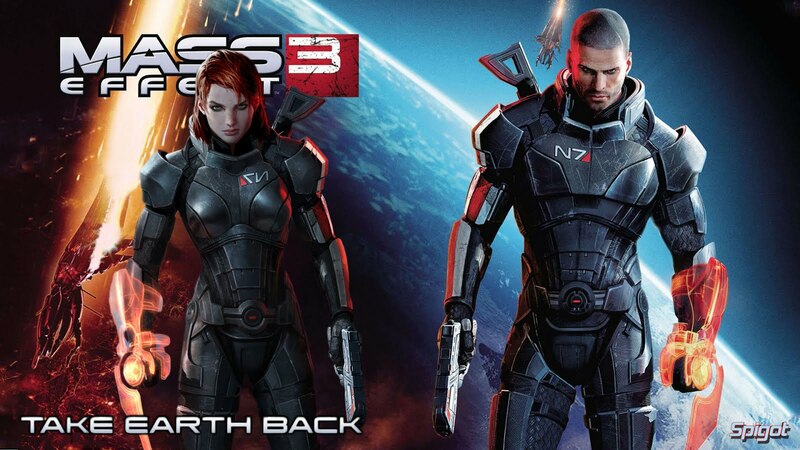 Male And Female verison of Commander Shepard on the front cover. 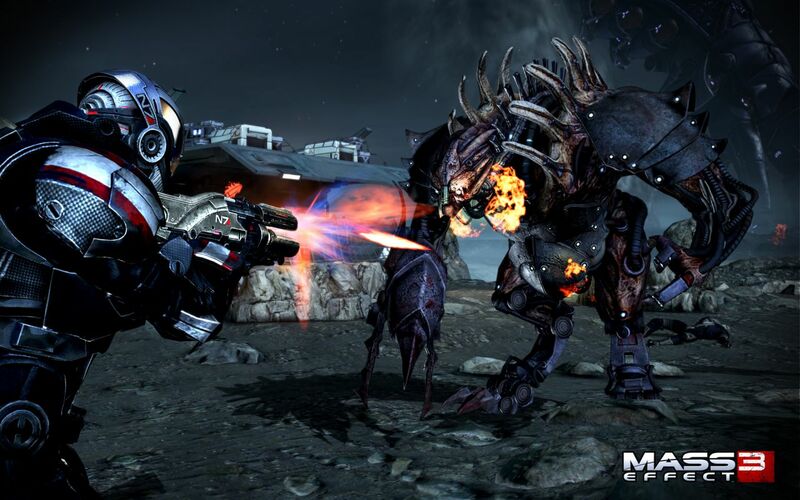 Mass Effect 3 is a action,role-playing, science fiction, third person shooter.This video game was developed by BioWare and published by Electronic Arts for Microsoft Windows, Xbox 360, PlayStation 3, and Wii U. It was first send on to the markets on March 6th 2012.Its the third game of the Mass effect series and the last one that involves the iconic Commander Shepard. The plot of the game is to save the galaxy from the Reaper. A race of ancient machines that come around every 50,000 years to destroy all advance organic alien species.The reaper harvest all these alien species they capture and than make them into there foot solider.There are many alien species in the galaxy that are at risk.Shepard must leave Earth his home to go out to find every bit of support he can get for the fight but he must convince each species of aliens to help him otherwise the galaxy will lose all of the most advance organic species. 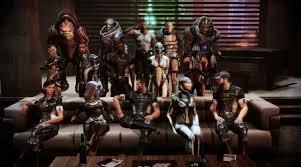 A image of most of the Main Character and people over are or were apart of Shepard crew thought out the Three Games. The Game play is quiet fun and exciting. You have a galaxy map that lets you pick what section of the galaxy and planets you can go to. You can also scan them if you want.But you can only land on some planets and only some have enemies to fight while others are abandoned.Most planets are empty or have lost all there resources because of reaper attacks and Cerberus attacks on innocent colonies (Cerberus are a Pro-human but they have turned bad and twisted there ideals mainly because of Reaper mine control). 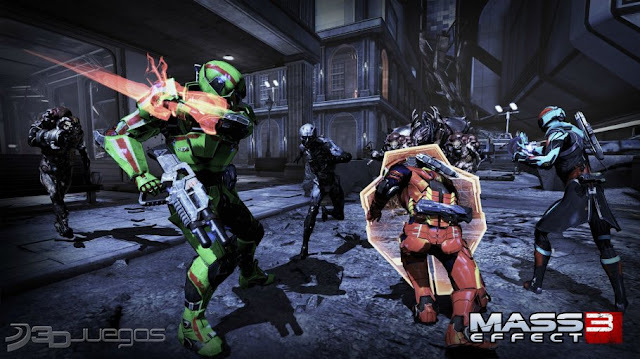 There is also a multiplayer mode where you fight waves of enemies in tiers of Bronze,Silver,Gold and Platinum.You could fight multiply different enemies Cerberus,Collectors,Reapers and the Geth. The controls for the game are standard when it comes to Third person shooter.Use your analog stick to move forward ,turn around run away.You run with X.You press Triangle to use a Quick power for example Vanguard uses biotic charge.You shoot with R1 and aim in with L1. L2 and R2 are used to quick select weapons and pick power ups for your squad and you can use there abilities .There is a recharge to your abilities which depends on the one you use if you use a biotic charge all your abilities need a recharge but if you use incendiary ammo your abilities recharge quickly. The Graphics within Mass Effect 3 are amazing.The characters look realistic and there very detailed even background character you don't interact with are still detailed to a point where they look human. The alien character are very detailed.They look realistic and more animal and human like than all other alien that are in games like this. The detailed to each mission level and debris around the map is quiet amazing and make you feel like your in a actual war zone. The music within the game is very rewarding and also very intense.You get a rewarding style of music near the end of a mission and you are about to complete it but for intense parts in mission where you have to fight multiple creature and enemies you get the intense upbeat music pretty much reassuring you that you can complete it.Each enemy has different sound and gives you a sense that you are right on the battlefield fighting against them yourself if your listen with a headset. 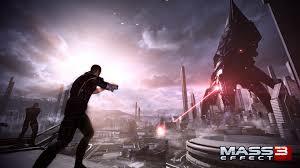 Mass Effect 3 has plenty of replay value for the fact that you can have conversations with different characters and reply to each character differently through out the game.You also have the option of going paragon or renegade which will effect your game based on the way you talk to people if you pick renegade options people will have a bad opinion on your character and if you pick paragon people will have a good opinion on your character.You can also import your character from Mass Effect 2 over to Mass Effect 3 and have more interactive option within the game. 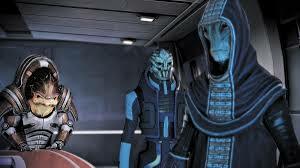 Mass Effect 3 is a great game with a lot of great ways to have fun and the story is a great continuation on a already brilliant story.But one of my main problems with the game is that the ending of the game is very vague ending and it was only fixed with a DLC (Downloadable Content).Because of this I will give this game a 9/10.